Good things come in small packages? Maybe true for jewelry, but certainly not on the grill. If you want to know how good big can be, order the pork tomahawk at Chi Spacca in Los Angeles. I’ve written about this Italian chop house before and I’ll tell you a lot more about it in a future blog. But for the moment, all you really need to know is that to cut the pork tomahawk, Chi Spacca’s chef starts at the top of the backbone and ends at the bottom of the belly, giving you a half circle of porcine awesomeness that includes the loin, tenderloin, rib, and pork belly. Forty-two ounces in all. I bet you can’t eat a whole one by yourself. But it’s sure fun to try. Country-style rib: A long slender pork chop cut from the neck—technically, not a rib. May or may not contain a bone. This is one ”rib” that’s so tender you can cook it by direct grilling. And its per pound price is super attractive. So what’s the best way to cook pork chops? You’ve got my number—on the grill. Today’s pork is tender and quick-cooking enough to be directly grilled—preferably over a wood fire or charcoal or gas fire enhanced with wood chips. You can also smoke pork chops low and slow, in which case, you want to start with chops at least 1-1/2 inches thick. 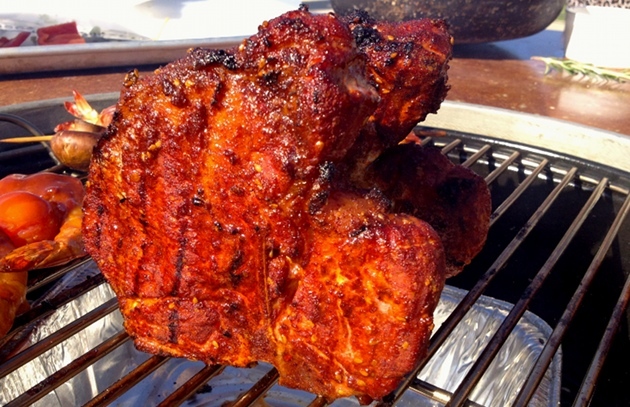 For wood, the sweet meat of pork has a special affinity for hickory, apple, maple, or cherry. The only drawback of the pork chop is its tendency to dry out, but, in a future blog, I’ll give you six fail-proof techniques for grilling or smoking moist tender pork chops every time.